I am all for innovation even when it may seem wacky. While an outlandish idea may never last in the mainstream it can move an industry forward. Here is one such example, the Pedalist by Virtue Bike. My initial gut reaction was, "May be this is gimmick for the show". There is no need to turn an upright bike into a car. This trike has a car-like shell complete with closing doors. From other shots I have seen it looks like there is a decent cargo trike under there. I get the idea of wanting to address many of the hazards of urban cycling. 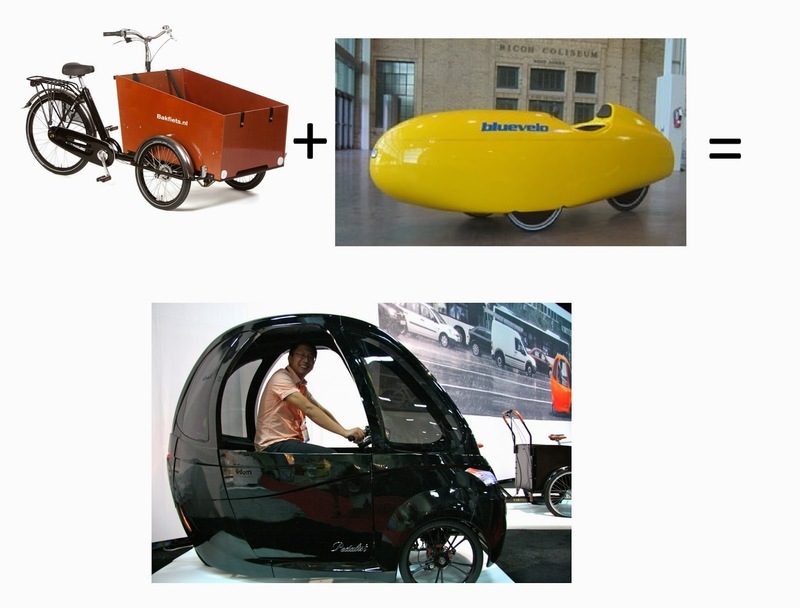 The Pedalist seeks to give the rider a highly visible riding position, shelter from the elements, and storage space all in an electrified bakfeits.These are real issues that could be a deterrent for some potential city cyclists. Again, I am glad Virtue took a bold step to offer the Pedalist. Every effort to get more people to trade in a car for a bike most cross town trips is a good thing. My thought with urban cycling is let a bike be a bike. The whole point of city cycling is to get out of the box. So let's not emulate the very contraption we are trying to escape. What do you think of the Virtue Pedalist?